After months of anticipation and leaks, the new Samsung Galaxy Note 9 has finally been announced. Samsung has unveiled the new S Pen, feature-packed with Bluetooth enabled functions for music and a remote camera shutter. For superfans and early adopters of the Note series patiently waiting to pre-order the Note 9, plan beforehand to protect your device. With whatever kind of protection you prefer, Spigen (as always) is ready to protect the powerful new flagship phone from day one. Head below to have your first look at Spigen’s complete collection for the Galaxy Note 9. You can also see the entire collection over at Amazon. Searching for a case that is easy and painless to install? Defend the Note 9 with the simple and clear Liquid Crystal. Preserve the original look of the phone through its crystal clarity without adding additional bulk to the Note 9. The raised edges preserve the infinity display and keep the dual-cameras protected, while allowing easy access to the newly positioned fingerprint sensor. Choose simple but slim protection with Liquid Crystal. For the minimalists out there looking for simple protection, a bulky case won’t cut it. The Thin Fit is perfect for those searching for a slim case that’s pocket-friendly, and protects against occasional drops and scratches. 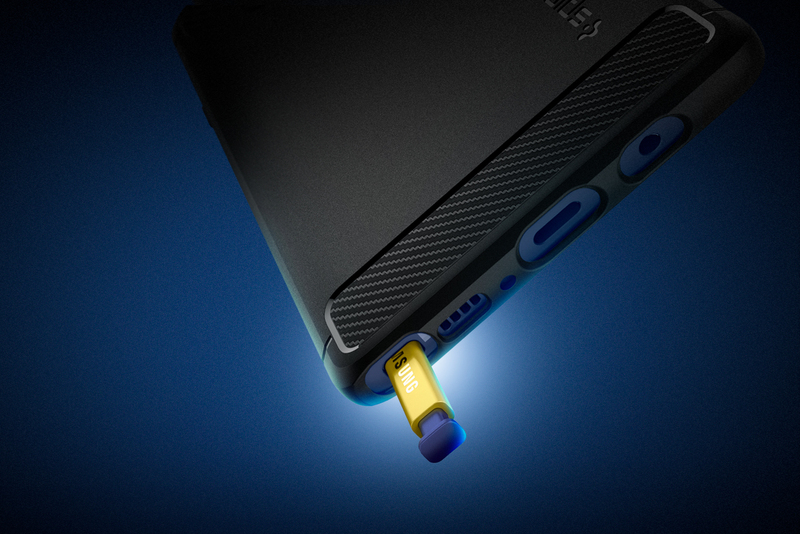 Just snap on the case for easy access to the new Bluetooth enabled S Pen. Keep the Note 9 lightweight with the Thin Fit and free yourself from the clutter of an unwieldy case. The Spigen Neo Hybrid features a versatile case, merging stylish designs with a modern look. 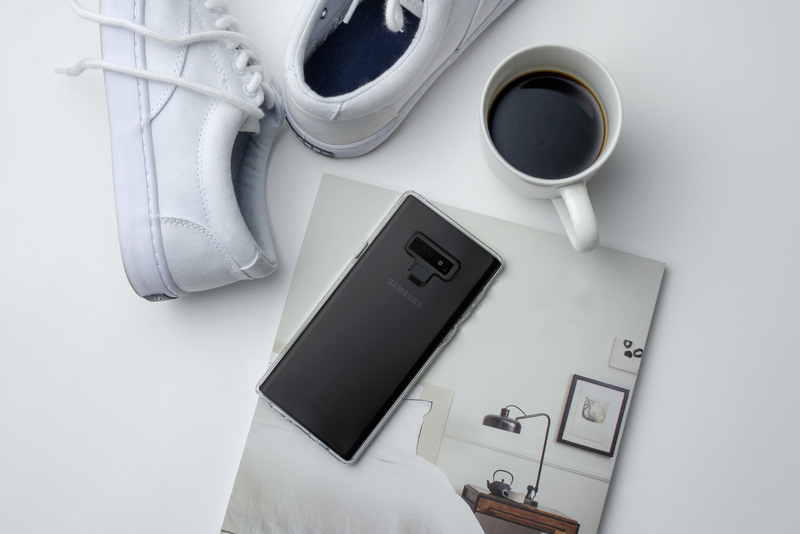 Whether you’re attending a formal event or a busy night out in the city, keep your Note 9 looking classy for any occasion. One of the most popular cases for the Galaxy series due to its new design, the herringbone pattern prevents messy smudges and keeps the sizable Note 9 from slipping away with improved grip. Combined with a flexible body and a durable bumper frame, the dual-layer protection is designed to remain ergonomic and easy to hold with one hand. For those that prefer the original look of the Galaxy Note 9 but seek the added protection of a case, the Ultra Hybrid is the solution. With exciting new colors being announced, look forward to showing off your device with its transparent protection. 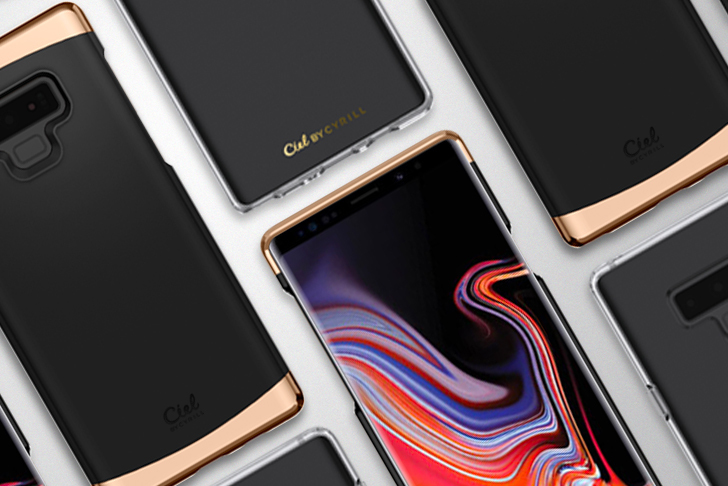 Add a little extra flavor to the Note 9 by inserting a special memory or photo behind this case. With the hybrid structure of a solid PC back, and a shock absorbent bumper worry less about unexpected drops. Uneasy about cracking the all-glass Galaxy Note 9 and being left with an expensive fix? The Tough Armor is a case powerful enough to keep up with your phone. Offering solid defense with an unyielding outer structure, their toughest case keeps your Note 9 covered for any demanding experience. While rugged cases are generally bulky, it’s been designed to be slim and pocket-friendly without backing down on protection. Snap out the kickstand to watch your favorite shows or comfortably take notes with the new S Pen. 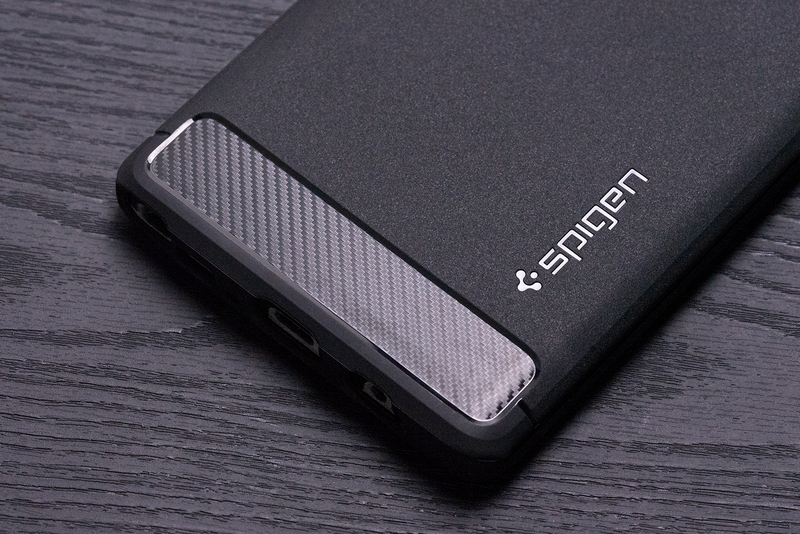 Spigen Rugged Armor continues to be a fan favorite due to its style and protection packed into a single layer. The matte finish significantly improves the grip of the Note 9, and subtle carbon fiber accents give the case a classy finish. The lightweight design adds little bulk and works flawlessly with wireless charging. Focusing on slim protection, it’s easy to see why the Rugged Armor is the go-to case to for many. After picking a case, keep the curved 6.4 inch Super AMOLED display protected with a NeoFlex screen protector. 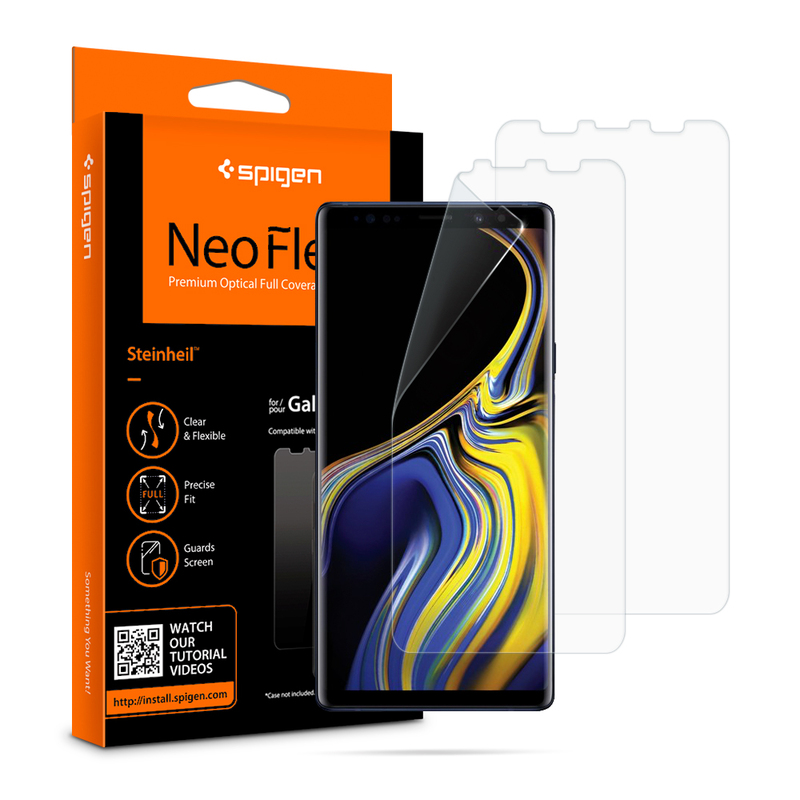 The NeoFlex has been designed to be compatible with all Spigen’s cases. Install one of the flexible urethane screen protectors to protect against scuffs and scratches. Once the screen protector is installed, wait 24 hours for the air bubbles to disappear. Note: This is a sponsored post. What does that mean exactly? We’re being upfront about sponsored posts, which are rare and are always marked as such. Sponsored posts are a way for us to get some extra revenue to fund the site (where you read content for free). They are not reviews and never will be, and you won’t find our opinions here. They are descriptions of apps or services, with images and information from the sponsor and sometimes contain our own findings (but again, not endorsements or opinions).